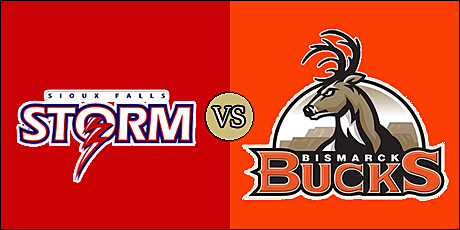 BISMARCK, ND - The Sioux Falls Storm opened up a 31-0 second quarter lead and rode a strong defensive performance to turn back the Bismarck Bucks tonight at Bismarck Events Center. The Storm struck first on a 13-yard field goal from Miles Bertner. Lorenzo Brown's 10 yard run put Sioux Falls up 10-0 midway through the opening quarter. The Storm defense got into the act with a pair of touchdowns in the latter half of the quarter. First it was Matt McKoy's three-yard interception return then, less than a minute later, Rick Rumph recovered a fumble in the end zone and the Storm held a 24-0 lead at the end of the first. Brown found Brandon Sheperd for a 32-yard touchdown to open the second quarter. The Bucks finally got on the scoreboard with a 18-yard field goal by Blake Levin. Darrian Miller's five-yard touchdown scamper extended Sioux Falls' lead to 38-3. Brown hit Damian Ford for a 16-yard touchdown to make the score 45-3 with a minute to go in the half. That would end up being the score at intermission. Bismarck scored early in the third quarter on a three-yard kickoff return from Mike Tatum. Brown and the Storm countered with a 37-yard pass to Sheperd and the Storm found themselves up 52-10 by the end of the third. Quarterback Homer Causey scored on a seven-yard quarterback draw, then rushed in for the two-point conversion and the Storm's lead stood at 52-18 with 1:27 remaining in the game. The Storm out-gained the Bucks in total offense, 212 yard to 158, including a 70 yards to 38 advantage in the running game.The Storm were penalized four times for 29 yards, while the Bucks were flagged twice for five yards. Brown was steady for Sioux Falls, completing nine of 167 passes for 142 yards with three touchdowns and an interception. He also rushed seven times for 33 yards and a score. Miller had 40 yards off six carries with a touchdown. Sheperd caught four balls for 80 yards and two scores, and Ford hauled in two passes for 20 yards and a touchdown. McKoy and DeAndre Scott had interceptions for the Storm defense. John Gibbs was nine of 18 passing for 84 yards with a pair of interceptions. Causey was four of nine for 36 yards and rushed for a touchdown. Former Storm receivers Mike Tatum and Brandynn Clark caught five passes for 79 yards and three passes for 23 yards, respectively. Antwan Smith had an interception off Brown in the first half. The Storm will host the Quad City Steamwheelers on March 22 with kickoff scheduled for 5:05 p.m. pacific (7:05 p.m. central). The Bucks have a week 5 bye before returning to action on March 30 at home against the Nebraska Danger. Kickoff in that one is set for 4:05 p.m. pacific (6:05 p.m. central).